Last year, we launched WhatDoTheyKnow Pro, our service for journalists and other professional users of Freedom of Information. As it’s a new venture, we’re keen to track whether it’s achieving everything we’d hoped for when first planning the service. One of the targets which we set, as a measure of success, is the number of impactful press stories generated by its use. What might count as impactful? Well, that’s obviously up for debate, but loosely we’d say that we’re looking for news stories that have a wide readership, and uncover previously unknown facts, offer new insights, or bring about change. A couple of recent stories, generated through WhatDoTheyKnow Pro, have ticked at least a few of those boxes. At mySociety, we keep a position of political neutrality — our services are available to everyone of any persuasion, and we don’t campaign on any political issue — so we present these stories not to comment on their substance, but to note that they certainly fit the criteria above. Brexit is clearly one of the most vital stories of our day, here in the UK, and while many might feel that we’ve had a surfeit of commentary on the issue, we can only benefit from understanding the facts. One of WhatDoTheyKnow Pro’s earliest users, Jenna Corderoy, broke two important stories on that topic. First, that UK parliamentary standards watchdog IPSA is investigating Jacob Rees Mogg’s hard Brexit European Research Group over their second bank account and ‘informal governance structure’. This also ran in the Daily Mail. Secondly (and this progresses a previous story about expenses – also uncovered thanks to Jenna’s use of WhatDoTheyKnow Pro) there is the widely-reported story that the Electoral Commission had misinterpreted laws around campaigning expenses, allowing Vote Leave to overspend. This was picked up by the BBC and Guardian, among many others. No matter which side of the Brexit debate you support, hopefully you will agree that it benefits society as a whole to have the facts out in the open. As a journalist, campaigner or researcher, you might be investigating a topic. Perhaps you’ve heard a rumour that you’re hoping to substantiate, or perhaps you’re inquiring more deeply into a story that’s already in the air. Using FOI, you can retrieve facts and figures to bolster your investigation. Once you have a story, you can publish it in a smaller publication like Open Democracy, testing the water to see if it gains any traction. If the story is well-received there, it’s easy to approach larger outlets with the proof (in the form of FOI responses) underpinning it. If you’re a journalist or you use FOI in your professional life and you’d like to try WhatDoTheyKnow Professional for yourself, then head over to whatdotheyknow.com/pro. Put in the code WELCOME18 when you sign up, and you’ll get 25% off your first month’s subscription. 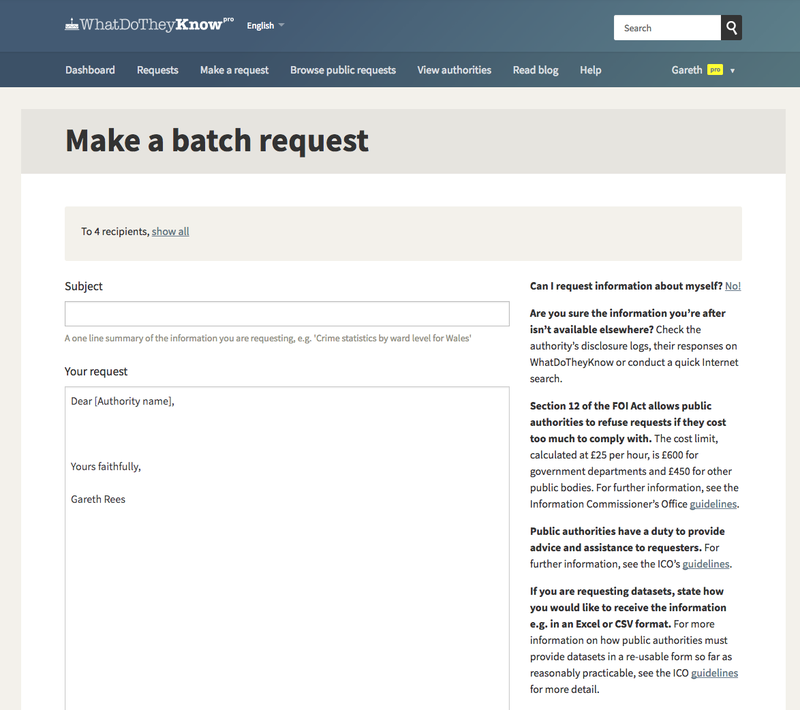 Back in March, we flagged up the ‘batch request’ feature we’d been working on for the WhatDoTheyKnow Pro service. Batch requests are now switched on for every WhatDoTheyKnow Pro subscriber, by default. Batch enables users to send the same Freedom of Information request to several bodies at once, and we spent a substantial amount of time building and testing it because we wanted to be confident that the feature wouldn’t be abused — or if it was, that we could catch irregular behaviour. Part of that testing has involved making the feature available to a limited number of WhatDoTheyKnow Pro subscribers, and loosely monitoring how it was used. We’re glad to say that during this four-month period, the activity was all acceptable. However, we also realised that we should tighten up our terms and conditions to reflect our expectations around usage of Batch, and add some advice to our Help pages about making responsible and effective requests, both of which we’ve now done. We’ve also added some automatic notifications that will alert the team when multiple batch requests are made, so that we can check that everything is in order. 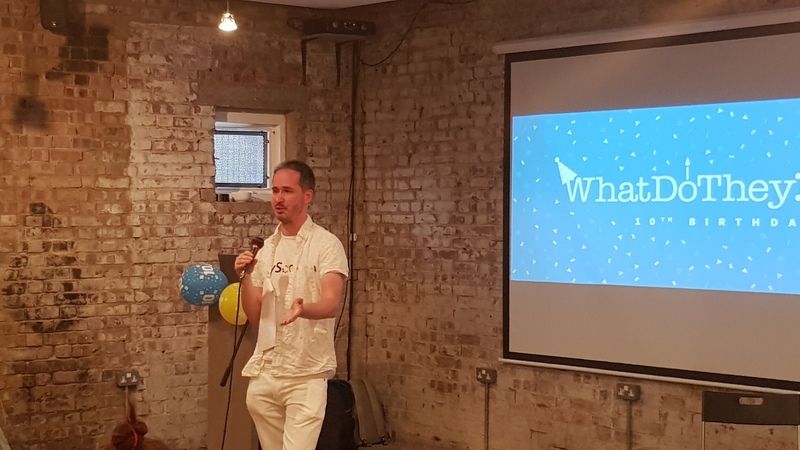 If you think Batch might be useful in your own work or campaigning, and you’d like to find out more about WhatDoTheyKnow Pro, you can do that here. 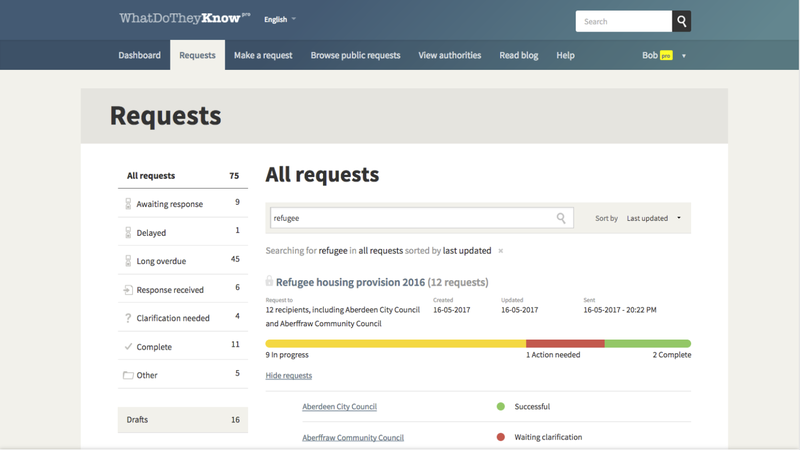 When we started building WhatDoTheyKnow Pro, our toolkit for professional users of FOI, we knew that there was one feature which would be a game-changer for such users: the ability to send a request to multiple authorities at once. In this blog post, we examine what we wanted the tool to do, how we are guarding against abuse, and finally we’ll give a step by step walkthrough of the interface. Investigative news stories or in-depth pieces of research often require information from a multitude of different sources. By gathering statistics or information from multiple authorities, journalists, activists and researchers can build up a previously-unseen picture, for example of how widespread a particular problem is, or where there are inequities in medical provision across the country. It’s something that many professional users of FOI are doing already, usually with the aid of their own homemade spreadsheets on which they keep track of requests made, dates by which replies should be expected, which bodies have responded, which need chasing, and of course the information held in the responses themselves. The standard WhatDoTheyKnow website already provides several helpful features that you just don’t get with a DIY system: it has all the right email addresses for authorities, for example; it guides you through the FOI process; and it will send you an email reminder when the deadline for response arrives — even taking bank holidays into account. But we knew that in order for our batch request feature to woo people away from their spreadsheets, it needed to do more than those homebuilt systems, some of which have been refined over several years and work well, even if a bit clunkily, for their owners. One important consideration was uppermost in our minds when it came to batch requests: it costs authorities time and money to respond to each request, and of course that multiplies with batch requests. We are keen to promote responsible use of FOI, so we want to fold appropriate safeguards and guidance into whatever system we build. As mentioned, with WhatDoTheyKnow Pro we’re focusing on features that are genuinely useful for professional users of FOI, but we also want to help those users make better, more focused requests — ones that are more likely to get useful responses and see the light of day as news stories. So it was important that, in making it simple to send multiple requests, we also help users find the most suitable authorities to send their requests to. Users are limited in how many batch requests they can send within any one month — so there’s no chance to go too wild. There’s a limit to the number of authorities that can be added to a single batch: we set this to be the number of local authorities in the UK, which is a logical sector to survey in this way. Before users do a batch mailout, we encourage the sending of an initial request that goes to just a few authorities. This safeguard can reveal where a request is flawed, so for example, if the data you get back is not what you need or in the wrong format, you don’t have to send to the full list all over again. We provide advice on cost limits to encourage succinct batch requests. Authorities have the facility to report a request which is unsuitable for review by our administrators. 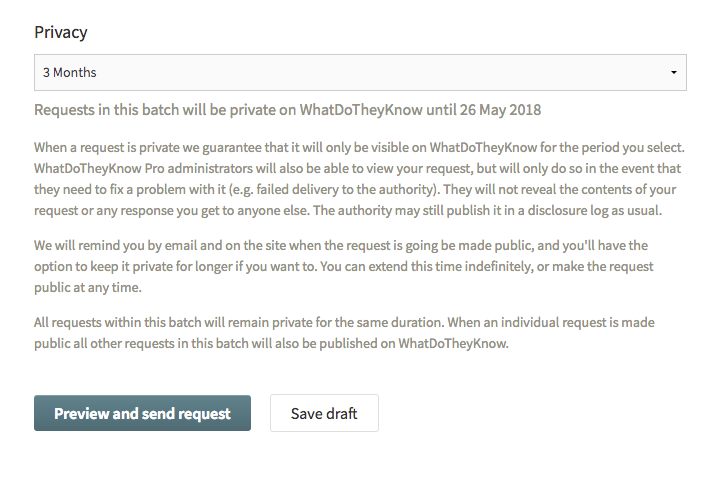 We’re rolling out the batch request functionality gradually to vetted WhatDoTheyKnow Pro users so that we can gradually learn how people use it in practice, and course-correct as necessary.. So far, the batch feature is only available to a select group of test users, who are giving us feedback on how they’re finding it. There’s certainly nothing like having your code being used by real people to help you see where improvements might be made! That said, it’s been a very gratifying process. 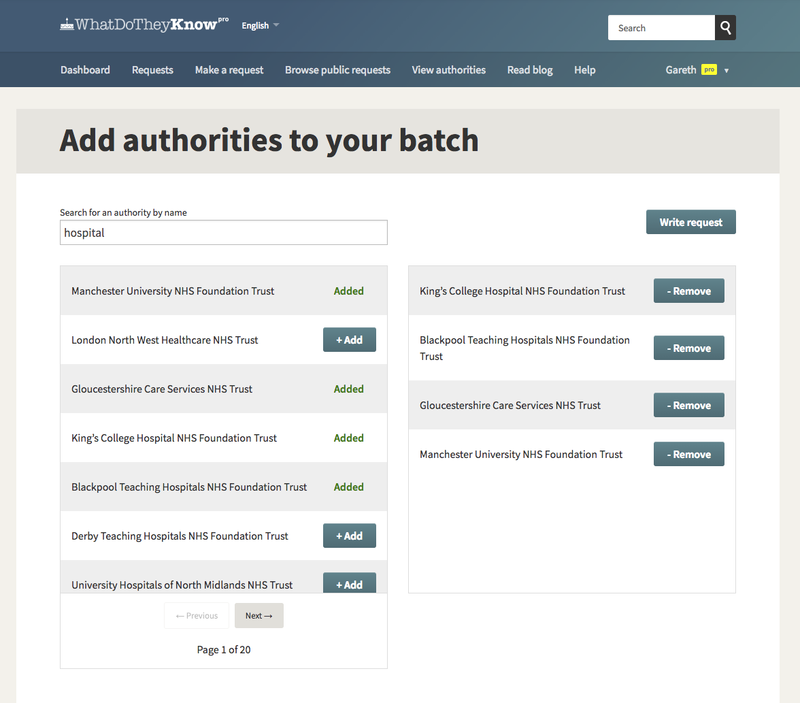 With the help of our test users, we’ve seen that the batch request functionality has the potential to be immensely helpful to professional users of FOI; even genuinely game-changing. We are certain that with the sending tools, we’ve created a service that really adds value for this sector. We’re now in the next phase, and turning our attention to improving the functionality that helps users deal with incoming responses when they come in. This already exists in a basic form, and thanks to our testers, we’ve identified which improvements we need to make. We’re already working on incorporating them. But that is definitely material for the next update — for now, let’s take a look at just how the batch request function works. 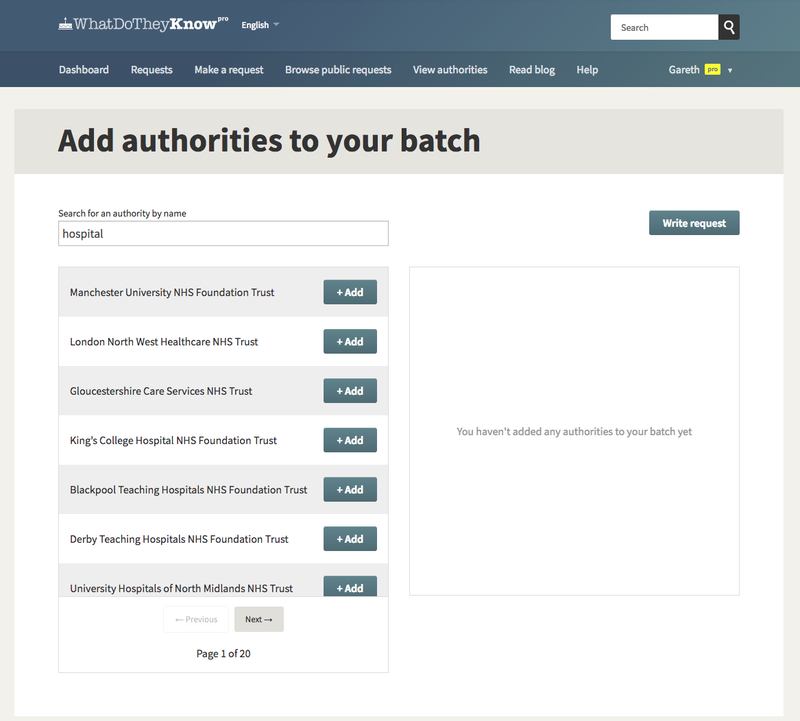 The batch request functionality builds on our super-simple FOI workflow tools for WhatDoTheyKnow Pro, extending them to make larger investigations much easier. The first step is compiling a list of authorities to send the request to. From the compose screen, you might search on a keyword (for example, ‘hospital’, ‘Birmingham’, or ‘Birmingham hospitals’) and then add the authorities you’re interested in. Each authority is added to a recipient list and WhatDoTheyKnow Pro creates a ‘mail merge’ setup. You’ll see how many authorities you’re writing to in the compose interface. You can then draft your request. The special `Dear [Authority name]` salutation gets automatically replaced with each of the selected authorities when you send your batch. 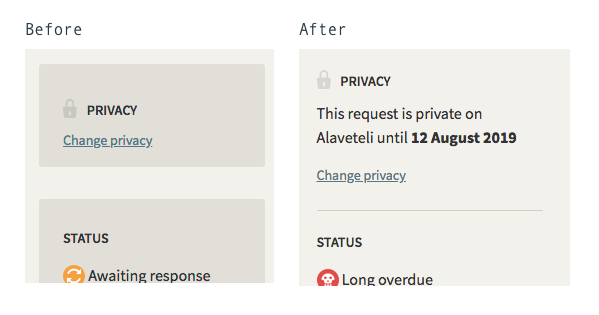 Finally, before sending you can choose a privacy duration. At this point you can either go straight ahead and send your request, or save the draft and come back to it later. Once you’ve sent your batch request, you’re going to receive a lot of replies from authorities. This is where WhatDoTheyKnow Pro’s functionality really comes into its own, keeping all that clutter out of your email inbox. In progress (yellow): This means that there’s no action needed by you – you’re waiting on the authority to respond with an acknowledgement or the information you’ve requested. 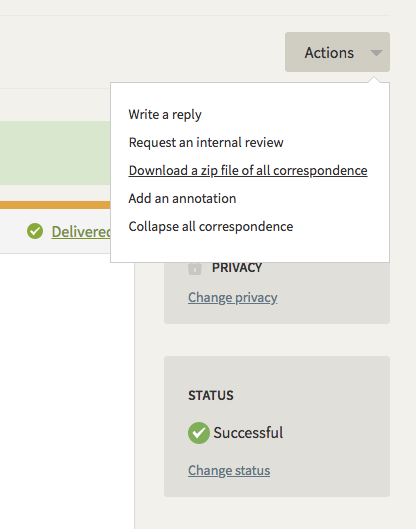 Action needed (red): When a request in the batch receives a response from the authority, you’ll need to check it out. We mark the response as “action needed” for you to review and decide what to do next. Complete (green): Once there’s no further action needed – either you’ve got the information you asked for, the authority didn’t have the information, or they’ve refused and you don’t want to challenge them – the request moves to the ‘complete’ state, so you know you don’t need to think about it until you come to analyse the data. Clicking the title of the batch reveals the individual requests and their progress status. From there, you can click through, read the response and update the status. Now you’ve got all your data, it’s time to compare the results from different authorities. Sometimes authorities will reply in the main correspondence. Other authorities respond with one or more attachments. You can view these inline or download them to your computer. If you’re dealing with a batch sent to lots of authorities, sometimes it’s easier to just download everything. You can download a Zip file containing all the correspondence and attachments for each request via the “Actions” menu. From there you can pull out the attachments that contain the raw data and plug the numbers or answers in to your spreadsheet so that you can compare across authorities. 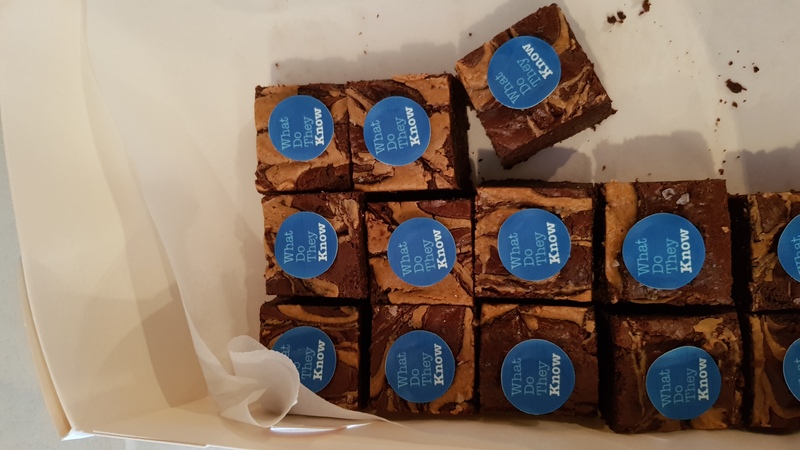 You can sign up to WhatDoTheyKnow Pro today and receive 1 month free with the voucher code BLOGMARCH18. Make some requests to try out the FOI workflow tools for professionals, and get in touch to request to join the waiting list for batch access. If your FOI requests have made the news, let us know! Send us links to your published stories and we’ll throw in an extra month of WhatDoTheyKnow Pro for free. Your stories help us improve WhatDoTheyKnow Pro. 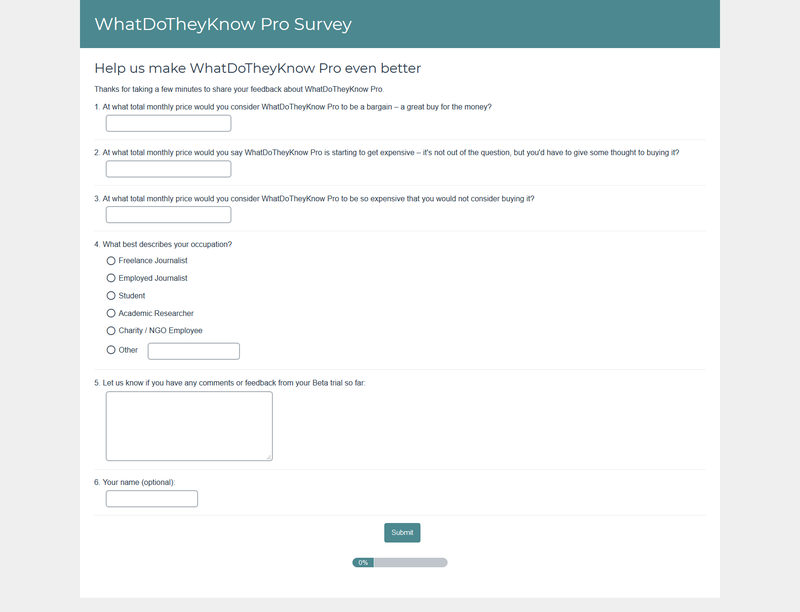 Comments Off on WhatDoTheyKnowPro has launched… quietly. If you happen to have visited the WhatDoTheyKnowPro page recently, you might have noticed that we’ve changed from offering free beta testers’ accounts to rolling out the payment interface. Yes, we’ve launched! But not with a bang: having quietly introduced the payment option, we wanted to wait for a while and check that there were no issues before making a public announcement. Consider this that public announcement. 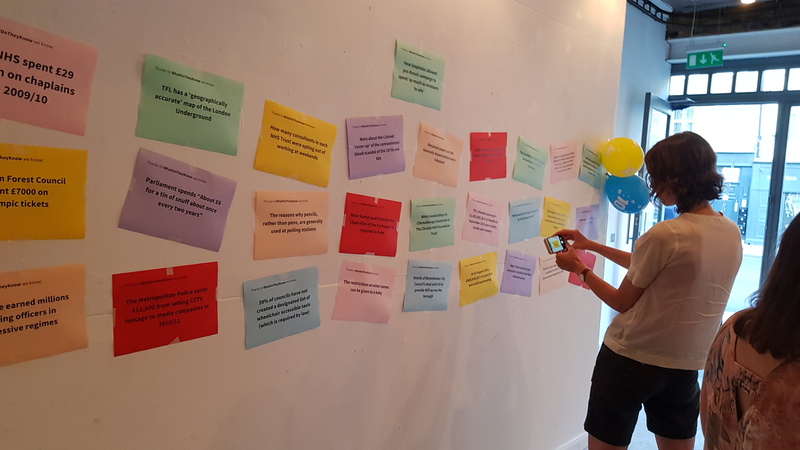 Just a reminder at this stage, in case you haven’t followed along with previous blog posts: WhatDoTheyKnowPro is a Freedom of Information toolkit which provides extra help with sending and organising requests. 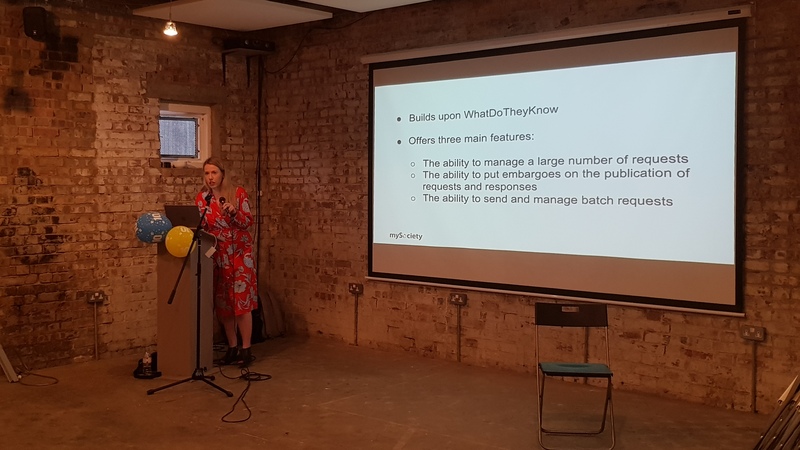 It’s designed to provide extra functionality for journalists and other people who use FOI in their jobs; if you’re a standard user of WhatDoTheyKnow, there’s nothing to pay and there never will be. We’ll always keep the site, and all its current functionality, free for everyone. Launching WhatDoTheyKnowPro provoked an interesting debate on where to position it, pricewise. It’s not that we’ve never put a price on any of our services before: mySociety is a social enterprise, and we charge for some use of our APIs; our council clients pay us for FixMyStreet Pro; you can buy transit-time maps on Mapumental. These sources of income are just part of what help us to provide our core citizen-facing services for free. And we’re hardly trailblazers in that respect: in fact, it was fascinating to read the Knight Foundation’s recent report Scaling Civic Tech and see how common it is in our sector to rely on a variety of revenue streams, from user donations to philanthropic grants, to paid-for services. But while we may have experience in charging for our services, it’s definitely the first time we’ve had to price up a Freedom of Information toolkit for journalists and professionals! We were effectively in the position of many an enterprise startup: with a market proposition that doesn’t exist in this exact form anywhere else. How do you know how to price something in those circumstances? Set it too low and you could miss out on important revenue; too high and you’ll alienate potential customers, many of whom are freelance journalists paying for their work tools out of their own pockets. Still, this project has been a process of tackling problems and questions thoughtfully — from deciding which features to include in this initial version, to debating how to encourage journalists to link back to the news stories they’ve created once they’re live. Perhaps we could bring the same approach to pricing. Fortunately, with over 100 beta testers, we had a pool of users who knew the service well enough to be able to give an expert opinion on how much value it was bringing them. Sending out a survey brought some very useful responses, not to mention feedback about what our beta users liked and what they’d appreciate in future roll-outs. That said, we’re well aware of research indicating that people are not always experts on what they are actually willing to pay. And of course, it makes sense that different people will attach different values to a service, depending not only on their own finances but, in this case all sorts of other factors such as how frequently they use FOI and how accustomed they are to paying for technology. Faced with responses to the survey that ranged between a suggested price of £1.00 a month to £50.00, that was, in some strange sense, reassuring to know. To be fair, those were the extremes. There was a good consensus in the middle and that helped us decide on an introductory price of £10 a month. We’ll assess this after a few months to see whether it’s bringing the number of sign-ups we expect. If you’re a journalist or someone who uses FOI in your work, you can now go and give WhatDoTheyKnowPro a go! We hope you’ll let us know how you find it.